A picture of Theresa May has been taken down at the University of Oxford to protect it from protests by students. The picture of the prime minister, part of a celebration of women who had studied at the university, had been “obscured” by critical messages. The portrait had been “plastered” with messages about issues including immigration, Windrush and Brexit. A university spokesman said removing Theresa May’s picture was “absolutely not done to make a political point”. Instead, the university authorities say, the picture had been taken down to keep it safe from “mainly humorous satirical messages”. 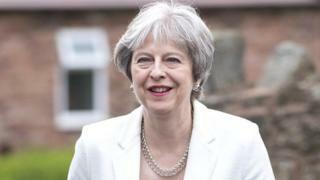 Protesters had used Twitter to say that the university should not be putting up pictures of Mrs May – making reference to the Windrush scandal. Messages added to the picture included “school of geography and hostile environment?” and a picture of Mrs May and Donald Trump captioned “complicit relationship”. The picture was on display at the university’s school of geography, as part of a series of portraits of “outstanding female graduates” from the department. “It has now been taken down and will be re-displayed so it can be seen as intended,” said a statement from the university.